Will Power has finally broke the ice after 4 dismal 2017 starts without scoring a top 10. Power has surged from lap 1 enroute to collect his 30th win of his career breaking a tie with Penske teammate Helio Castro Neves and 4-time Indy 500 winner Rick Mears after braking the lap record for his pole. 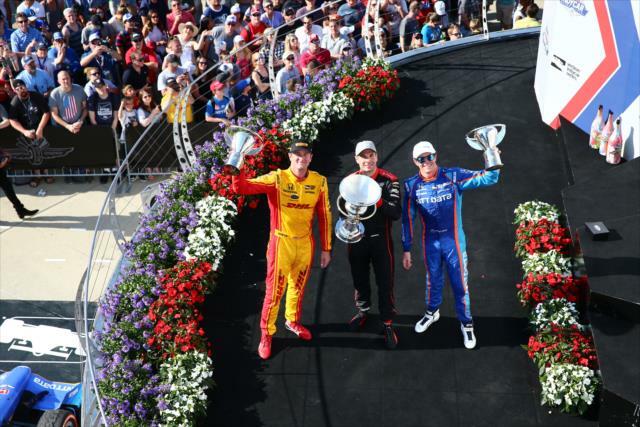 Scott Dixon would finished 2nd followed by Ryan Hunter-Reay. Reigning Indy Car series Champion Simon Pagenaud would finish 4th. Castroneves completes the top 5. Graham had a spectacular race moving 14 spots to finish 6th. The former Marussia drivers Max Chilton and Alexander Rossi would go 7th and 8th perspectively. Spencer Pigot and guest driver Juan Pablo Montoya round up the Top 10. But it was a bad day for Josef Newgarden who was solidly in 3rd when he was caught speeding in the pits 3 times that pushed him down to 11th. Pagenaud continues to lead Dixon followed by Newgarden and Castroneves. Power moves up to 5th as they switch from the Road Course to the Oval at the end of May.